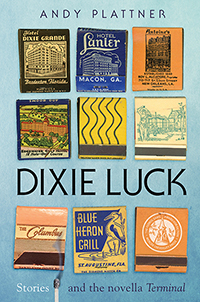 DIXIE LUCK features stories about hardy gamblers, look-on-the-bright-side salesmen, and other brands of optimistic Southerners. The stories are set in locales from Hot Springs, Arkansas, to the Atlantic Coast; each city or town seems to hold its own version of good fortune. The collection also includes the Faulkner Award-winning novella TERMINAL, a tale that finds a husband and wife reuniting in hopes of finding one final cash-out at the windows. The stories are literary--they study characters who try to stay honest and upbeat in the face of stacked odds. In "Valdosta," a salesman tries to look at the bright side of a product promotion that deals with disaster preparation. "Confetti" is a story about a gambler who cannot find the right words to say to a woman he loves; he takes a good day at the racetrack as a sign he is still heading in the right direction with her. In another story, "Resort Life," the narrator escapes his troubled family life by focusing on his work as a hotel manager. He believes a life of complication will not find him there.